If you’re eating a low-carb diet as part of your weight loss program, breakfast time can start to get a little boring after awhile. Many foods enjoyed during the first meal of the day are awfully high in carbohydrates – oatmeal, muffins, toast, cereal, waffles, pancakes – and the list goes on and on! I’ve tried a lot of different ways to make breakfast interesting, but there are only so many ways you can make eggs or an omelet, and even Greek yogurt and fruit gets a bit boring after awhile. One Saturday morning, I woke up and just had to have something different for breakfast, something that really would satisfy a craving – I made pancakes. Using two separate, small bowls, beat the two eggs and water together in one, and mix all the dry ingredients together in the other. Add the egg mixture to the dry ingredients and whisk for about 2 minutes or until most of the clumps disappear. Spray a non-stick pan or griddle, and heat it before cooking your pancakes. 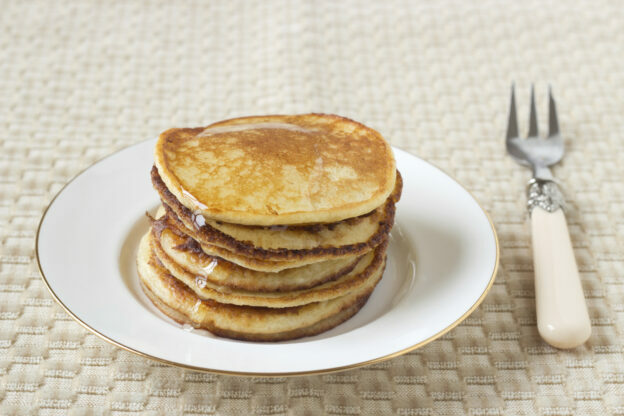 Use a large spoon to add the batter to the griddle to make the pancakes about 2” in diameter. Cook to your preference as you would any other standard pancake. You can easily double or quadruple the recipe to serve more diners as needed. The recipe is gluten-free, high in protein and low in carbs, which is perfect for my own high-protein, low-carb diet! Obviously, adding a little butter and sugar-free maple syrup will increase the calories a bit, but when you start off this low, the extras aren’t going to ruin this delicious low-carb breakfast treat! This entry was posted in Weight Loss & Management Advice and tagged low carb breakfast recipe Virtual Weight Management, low carb easy recipe, low carb pankcake recipe, low carb recipe, weight loss maintenance, weight loss management on June 25, 2014 by Mike Evans. One of the most frustrating things we have to deal with during any diet is the feeling that you’re being deprived from eating good food. Depending on the type of diet you’re on, what we would typically consider really good tasting foods are now forbidden to us, while we watch family and friends happily enjoying them all around us. When I started my current wellness plan, the limitations on sugar, carbohydrates and sodium prescribed by Dr. Sam felt like torment! So many foods were instantly removed from my list, and my list of potential ingredients seemed to dwindle every time I visited the grocery store. What I really wanted was to make something that was great tasting and felt like it was off my diet, but it actually wasn’t. I wanted a low carb easy recipe, so I started experimenting with what possible ingredients I could still use to make a really good pot of chili. 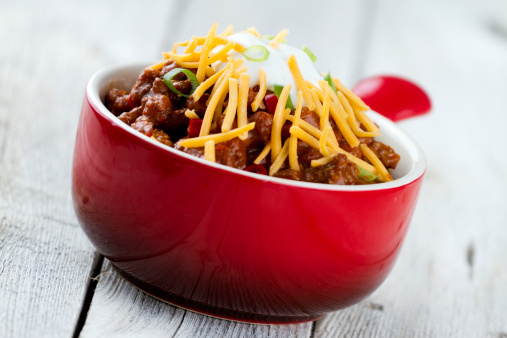 Personally, I can eat chili year round, and it’s one of those meals that will have plenty of leftovers – a great thing if you’re trying to stretch your grocery dollars! My final recipe draws elements of mole style cooking, combined with Texas style no-bean chili. Going bean-less really lowers the carbs! 4-6 oz. of fresh chili peppers – diced (I usually use a combination of 3 serranos, 2 jalapeños and one habenero – I like spicy!) Note: When dicing the chili peppers, latex gloves are recommended to avoid burnt fingertips. Brown the ground beef in a stew pot in the olive oil, breaking the meat up into fine pieces. Add the diced onion and green pepper, cooking it in the meat until the onion starts to turn a little translucent. Add the chili peppers and all the spices, mixing them into the meat/veggie mixture until everything is well coated with spices. Stir in the canned tomatoes and crushed tomato, and then add the water, stirring everything together well and continuously until the pot comes to a light simmer. Reduce heat to medium/low, and let it cook uncovered. Simmer the chili for 4-6 hours, stirring once every 30 minutes while the chili reduces. Serve with shredded cheddar cheese on top. Yields approximately eight 10-12 oz. servings. I’ll be sharing more from my low carb easy recipe files in the near future! This entry was posted in Weight Loss & Management Advice and tagged low carb chili recipe, low carb easy recipe, low carb recipe, mole chili con carne, Virtual Weight Management, weight loss maintenance, weight loss management on April 21, 2014 by Mike Evans.